I’m never one to turn down a good foodie challenge. Other kinds of challenges, maybe – I remember refusing to abseil down a 15 foot wall (which isn’t even that tall!) when I was about 11 because I didn’t see the point of putting myself through all that stress just for the sake of it (why not just stay on the ground in the first place? Much simpler). When it comes to certain parts of life, I’m not exactly adventurous. With food though, I love trying new things – hence the number of vegan recipes, gluten-free recipes, low carb recipes etc. on this blog, even though I don’t follow those diets myself. I just find it interesting to challenge myself to try something new. St Helen’s Farm, who make a whole range of goat’s milk products, recently challenged me to vary my dairy by introducing some goat’s milk into my diet as well as the usual cow’s milk. I did have to do a bit of research to check I was allowed goat’s milk now that I’m pregnant (from what I could tell, pretty much everything is fine as long as it’s pasteurised, apart from soft mould-ripened cheeses, which are a no-no). Once that was out of the way, I was raring to go. They sent me a variety of products from their range, which I’ve been enjoying all week. Sorry, there’s a yogurt or two missing from the photo – I started digging in before remembering I should actually do some work rather than just eating it all. The yogurts are suuuuper creamy (I was surprised how good they were! ), and I’ve been enjoying the goat’s milk on my cereal this week. It tastes different enough from cow’s milk that it feels like you’re having something a bit different, but not so different that it feels completely alien. My favourite products from the range are the cheeses (what did you expect?). I adore goat’s cheese. Here I combined the smooth, spreadable goat’s cheese (which I suppose is a bit like cream cheese, but with more flavour) and the hard goat’s cheese to make a rich and silky pasta sauce. 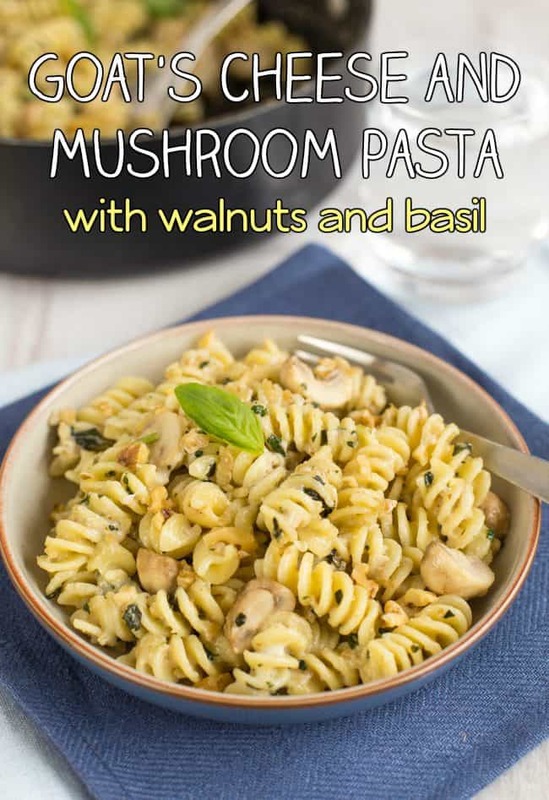 The pasta’s mixed with some garlicky sautéed mushrooms (helloooo), and some roughly blitzed basil and walnuts. I suppose it’s a bit like a simple, coarse pesto. The walnuts might not be overly obvious in the photos, but they add a beautiful crunch that goes really nicely against the creamy goat’s cheese sauce. 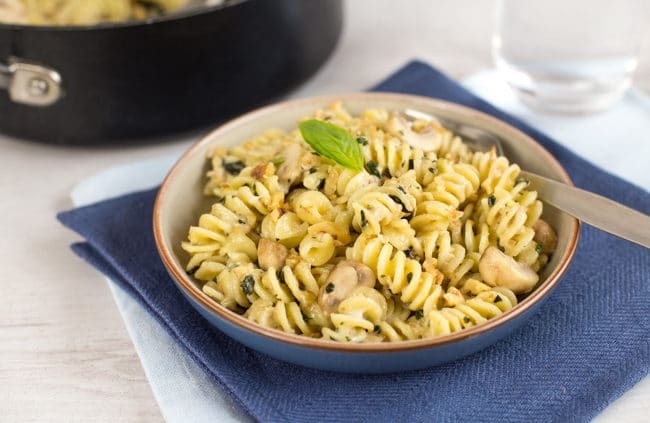 Definitely a combination I’ll be using again – especially since this whole pasta dish can be made in about 20 minutes (my kind of recipe). 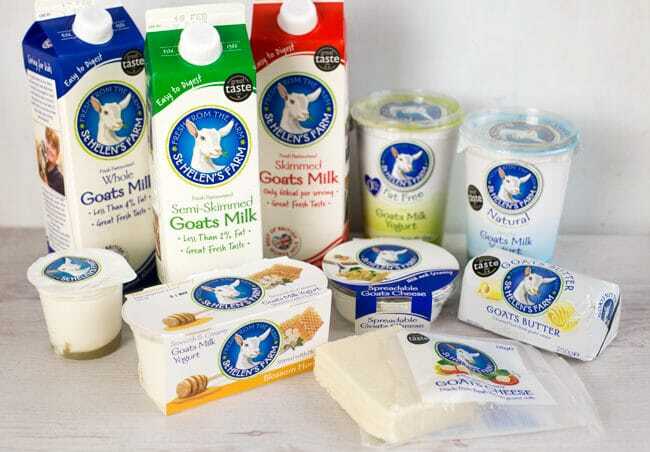 Do you use many goat’s milk products in your kitchen, or do you tend to stick to what you know? Boil the pasta in plenty of water until cooked to your liking, around 12-15 minutes. Meanwhile, heat the oil or butter in a large frying pan, and add the mushrooms. Cook for a few minutes over a medium heat, then add the garlic, and cook for a few more minutes until the mushrooms are soft and the garlic is fragrant. 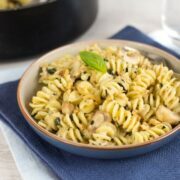 Add the fresh basil and walnuts to a mini food processor, and blitz for a few seconds until coarsely chopped (if you don’t have a mini food processor, just roughly chop by hand). Add the walnut mixture to the mushrooms, along with the grated hard goat’s cheese, spreadable goat’s cheese, and a dash of milk. Season generously with salt and pepper, and stir everything together until the cheeses have melted to give a smooth sauce. When the pasta is cooked, drain it and add it to the pan with the sauce. Toss to coat, and serve topped with more fresh basil if desired. 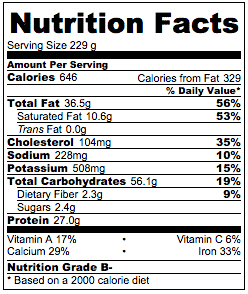 Note: Nutritional information is approximate, and depends on exactly what ingredients you choose. Information above is for 1/2 the recipe. Next Post » How is olive oil made? I made this tonight for dinner and it was spectacular! I accidentally only had about 30g of walnuts (bad planning on my part), but I topped up with 20g of pecans and it worked very well. :) Thanks for posting such a great recipe, Becca! I’ll definitely make this one again. I lurv goats cheese! and yes I do love experimenting with new textures, ingredients and the like. I love the sound of the crunchy walnut and creamy sauce ummmm! Good to know its safe to consume when ur preggers! Seems like pretty much the only thing I’m not allowed is brie – which is terrible, but it could be worse!! I’ve never seen you can get all these goats milk products! Being a total goats cheese fiend I will have to give them a go. 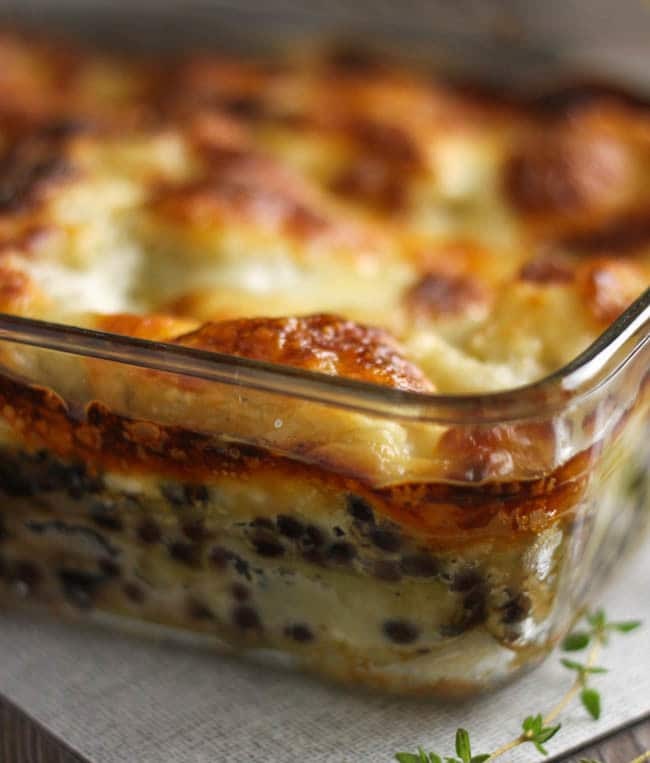 This looks like perfect comfort food, and full of great flavours! Oh man, I totally missed your pregnancy announcement before – where the heck have I been?! Congratulations…so exciting! Parenting is the best and hardest job in the world…mostly the best! 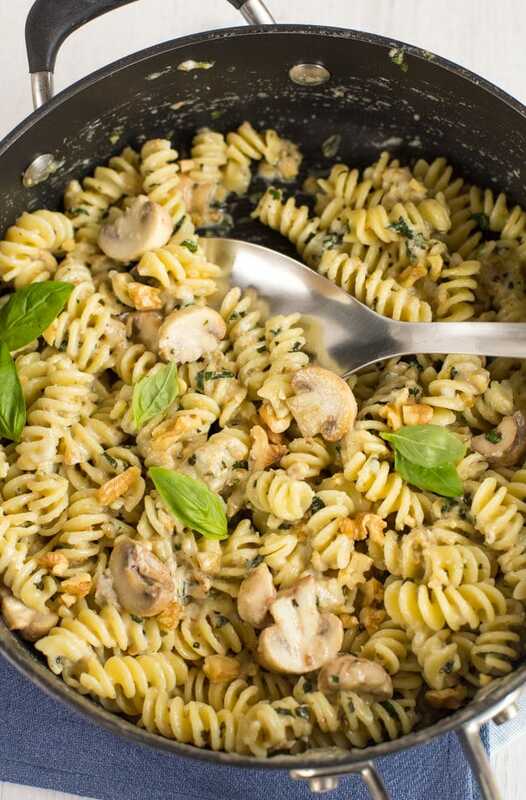 And this pasta looks amazing – so creamy – and those mushrooms!! My fave! This sounds delicious! I have a friend who can’t have cow’s dairy, but he can have goat’s milk just fine. He will love this recipe (he’s a total foodie!). I’m going to send this to him now! Goat cheese is a delicious way to add a great zing to a dish. I’m loving everything in this, great recipe. 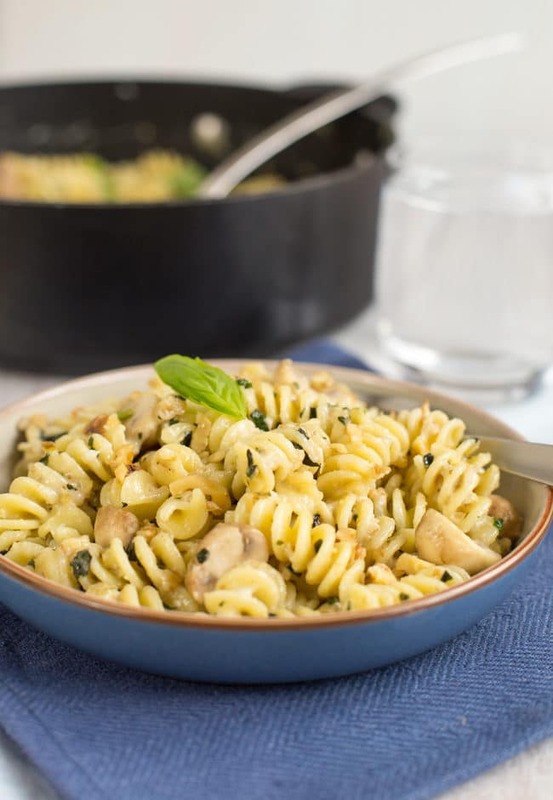 I love just adding soft goat cheese to hot pasta for a really quick sauce so this is like a step up! And I’m so jealous of that package-I would have forgotten to take pictures too. I’ve only ever used goat cheese in my cooking and baking but I’ve always wanted to try other goat milk products. Yum! I love goat cheese, but have yet to have it in pasta. Same with walnuts. This is incredibly creative. Your photos are awesome. This sounds AMAZING! Proper comfort food this. I’m salivating just looking at the photos! First, CONGRATS!!!! Loved reading your very exciting news! Great job incorporating goat cheese into this dish a very authentic way. I can’t wait to give it a try. Sharing on Desserts Required’s FB page this week. Ooh I’m intrigued by your homemade soap! Goat’s cheese macaroni cheese sounds amazing. Never thought of putting walnuts in my pasta but it sounds like a good addition, just makes it more nutritious, right? I don’t normally buy goat’s milk products but I do buy feta from time to time. Definitely, and they add a great texture too!